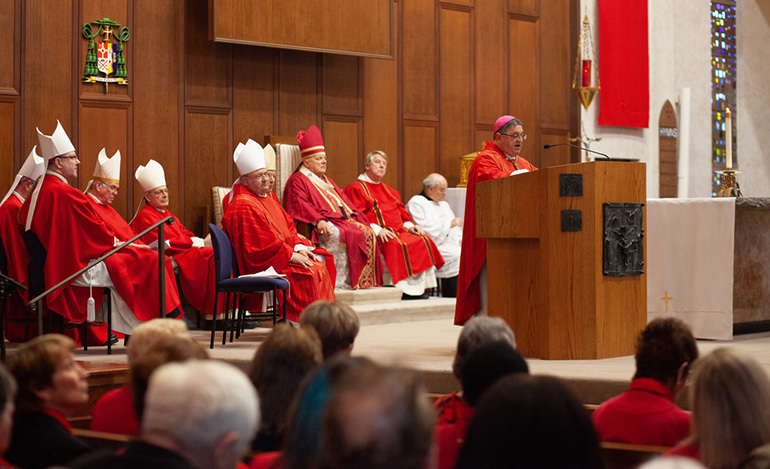 Miami Auxiliary Bishop Enrique Delgado preaches the homily at this year's Red Mass of the Holy Spirit, celebrated March 27, 2019 at the Co-Cathedral of St. Thomas More in Tallahassee. TALLAHASSEE | Ora et labora: Pray and work. 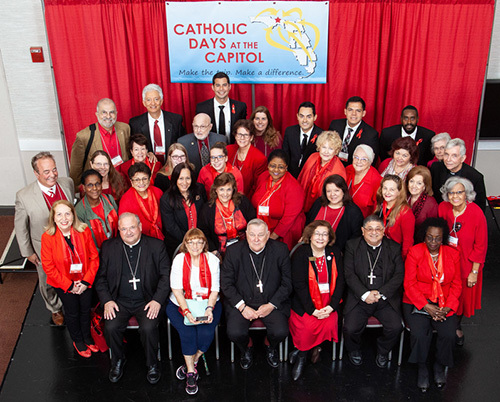 Those are the two pillars of Catholic Days at the Capitol, the annual event where Florida’s bishops and lay diocesan representatives meet with state legislators to advocate for laws that protect and defend human life and dignity. 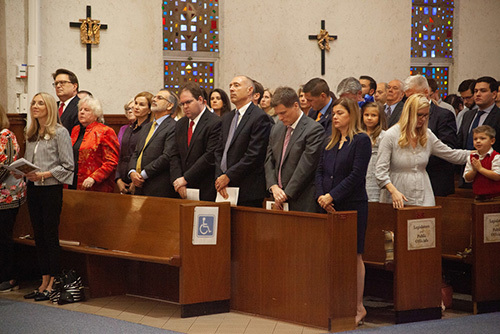 Legislators take part in the Red Mass of the Holy Spirit celebrated March 27, 2019 at the Co-Cathedral of St. Thomas More in Tallahassee. Miami's bishops, Archbishop Thomas Wenski and Auxiliary Bishops Peter Baldacchino and Enrique Delgado, pose with the archdiocesan delegation to Catholic Days at the Capitol, which included representatives of the Miami Archdiocesan Council of Catholic Women and five seminarians invited by Father Michael Greer, pastor of Assumption Parish in Lauderdale-By-The-Sea and spiritual advisor to the women's group. The trip is organized each year by the archdiocesan Respect Life Office. The Florida Conference of Catholic Bishops sponsors Catholic Days, which this year took place March 26-27. A highlight of the event is the annual Red Mass of the Holy Spirit where bishops, laity and Catholic legislators come together to pray for divine guidance. Now in its 44th year in Florida, the Red Mass is a tradition that dates to 13th century France. It takes its name from the color worn by the celebrants, red for the Holy Spirit. Praying in the Co-Cathedral of St. Thomas More, Msgr. Thomas Skindeleski asked God to bless all present and for aid from God to create legislation that will help the people of Florida. “It’s one of the few times you can get all the bishops of Florida together,” said Jeanne Berdeaux, director of Respect Life Ministry in the Diocese of Venice, referring to the importance of Catholic Days. In meetings with officials of the Florida bishops’ conference and their Tallahassee representatives, delegates from all seven Florida dioceses had an opportunity to discuss how laws and regulations being considered by legislators would conform to Catholic principles and affect the most vulnerable and marginalized populations in the state. Of the three topics discussed, Florida Gov. Ron Desantis’ Bold Vision for a Brighter Future was paramount. The proposed $625 million fiscal year budget ($2.5 billion projected over the next 4 years) would benefit Florida’s Everglades conservation and water quality. Along with the restoration of Florida’s numerous water springs, alternative methods to provide clean water, and rid shorelines of algae, would all be tackled in the new bill. The Bold Vision bill would secure new jobs as well. Protection for southern Florida’s marine life would guarantee investments in job creation, such as a task force assigned with algae prevention and other scientific studies aimed at purifying Florida’s rivers and beaches. In 2018, southern Florida suffered heavily from red tide. “You can’t go to the beaches anymore,” Berdeaux said. Lee County coastlines especially, such as Ft. Myers Beach and Sanibel Island, took hard economic hits from reduced beach-goers and saw a lack of tourism from media coverage. “It’s a very important issue,” she added, noting that the quality of enjoyment that visitors from around the world come to experience has been hindered by the harmful algae that destroys most fish and other sea life. Florida’s focus on parental involvement in children’s lives also figured prominently in the bishops’ conference concerns. Two new bills explored in the Senate and the House would create the Family Empowerment Scholarship Program that would raise grant options for lower-income families without compromising current programs, such as the Florida Tax Credit. Although the Florida Tax Credit has existed for over 14 years, ensuring education provisions for families-in-need, it experienced a massive reduction in corporate donations last year, even though “corporations give donations as a tax right off,” Berdeaux said. “But the donations have plateaued.” Approximately 13,000 Florida students on the waiting list for scholarships are presently in flux as a result of this cutback in contributions. Senate Bill 7070 and House Bill 7075 would alleviate the waiting list and give considerable power to parents by allowing students to choose free or non-public schools to attend, such as Catholic schools. Florida’s Catholic schools have been applauded for their high-achieving status in reading and math for many years. The rights of pregnant minors also were discussed at the event. Currently, parental permission is not required for abortion, only a “notification” from the clinic to the parent. Bypass measures presently allow minors to petition Florida courts to have abortions without parental knowledge. “What if they send it [the notification] to the wrong house?” Berdeaux said of one of the various ways a minor could still maneuver to obtain an abortion. Senate Bill 1774 and House Bill 1335 would correct that by only allowing a minor to abort a pregnancy if specifically permitted by her parent. Berdeaux is confident of these bills “will be able to stand in court,” she said. The proposed laws would provide free counseling to minors without funds and would permit judicial waivers for abortion if the pregnancy was the result of force. 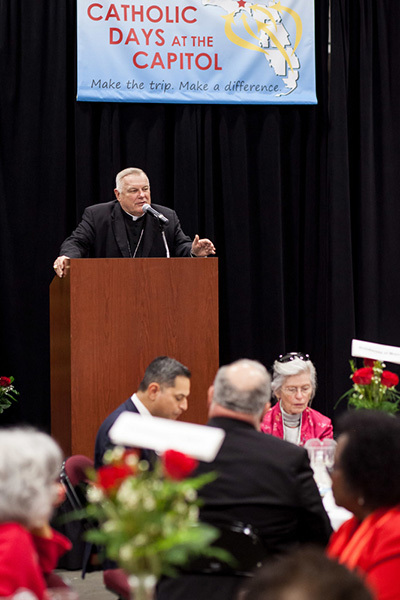 Catholics who can’t make it to Catholic Days are encouraged to take on political responsibility and strengthen the presence of Catholic values in the public square by keeping abreast of the issues and the bishops’ positions on them. The best way to do that is by joining the Florida Catholic Advocacy Network (FLCAN), a statewide, online community established by the bishops of Florida to connect, educate, and mobilize Catholics across Florida’s seven dioceses on public policy issues pertaining to life, dignity, and the common good. Action alerts on key bills at both the state and federal levels that allow for quick and easy messaging to elected officials. Reports, summaries, and educational materials that identify legislative proposals affecting issues important to our faith. Calls to prayer for the people of our state and nation and our elected leaders. Those interested can sign up here: https://flaccb.org/join-take-action. 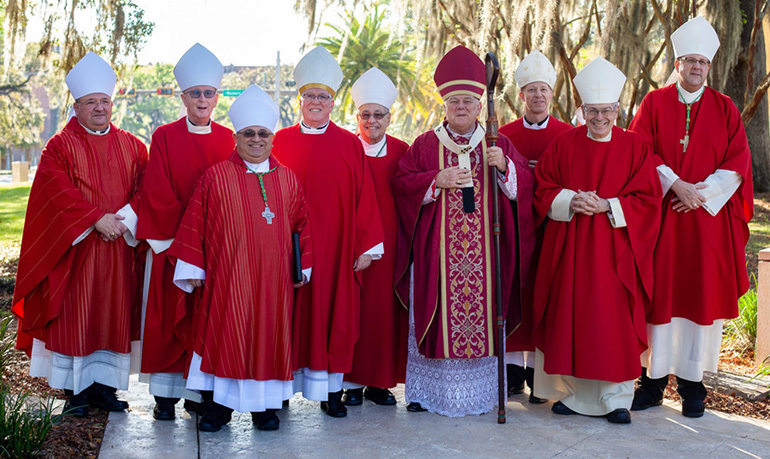 Florida's bishops pose outside the Co-Cathedral of St. Thomas More before celebrating the annual Red Mass of the Holy Spirit March 27, 2019 in Tallahassee. From left: Miami Auxiliary Bishop Peter Baldacchino, Orlando Bishop John Noonan, Miami Auxiliary Bishop Enrique Delgado, Venice Bishop Frank Dewane, St. Augustine Bishop Felipe Estevez, Archbishop Thomas Wenski, Pensacola-Tallahassee Bishop William Wack, Palm Beach Bishop Gerald Barbarito and St. Petersburg Bishop Gregory Parkes.